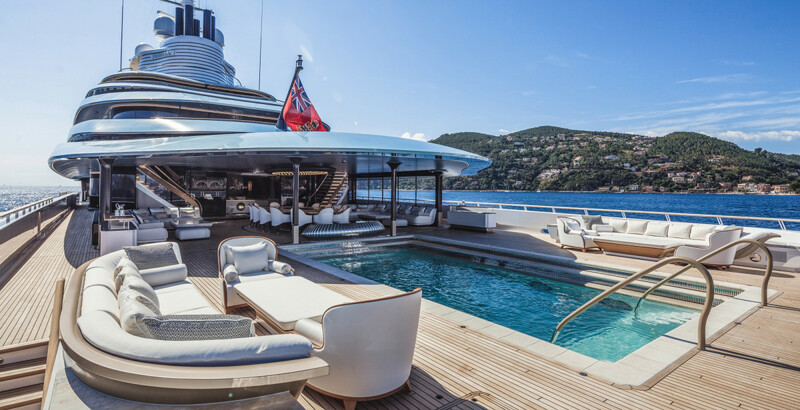 Oceanco’s Jubilee required technical innovation, creative design and a build shed longer than a football field. 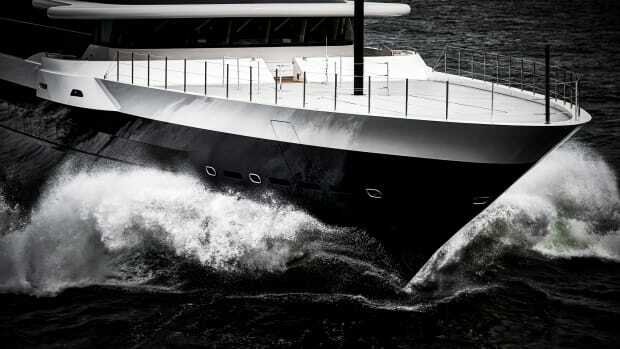 Some yachts create widespread buzz. 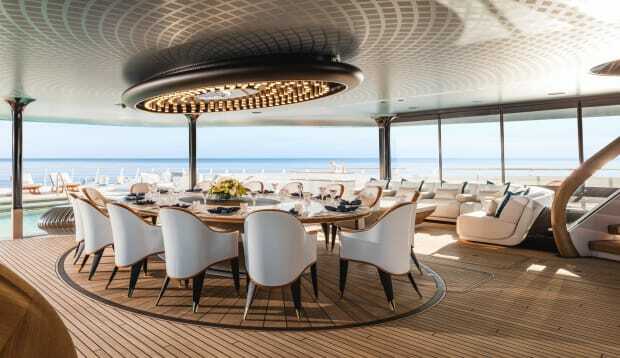 Oceanco’s 361-foot (110-meter) Jubilee is just such a yacht. It’s not so much her size that has people talking, but instead the way she looks and feels. Merging modern architecture with car and yacht design, she combines fast lines and smart surfaces with elegant proportions. Lobanov, a Moscow native, has a background in automotive and aviation design. 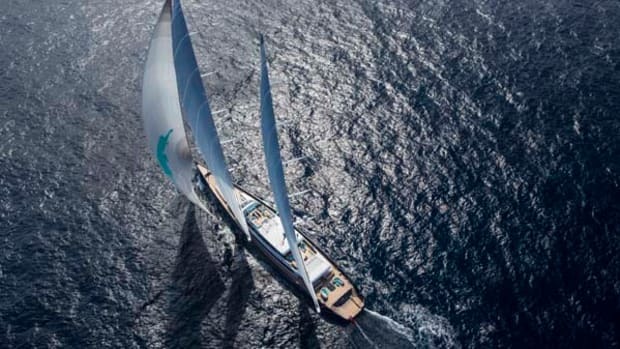 After a chance meeting with a superyacht owner 15 years ago, he became the owner’s representative for the build of the 390-foot (119-meter) Blohm+Voss A and then established Lobanov Design with his wife, Yulia, who is an artist. 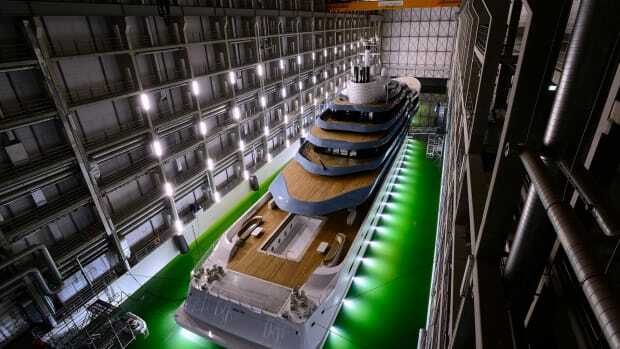 Jubilee is Lobanov Design’s second yacht; its first was the 281-foot (85.6-meter) Oceanco Amore Vero, launched in 2013. 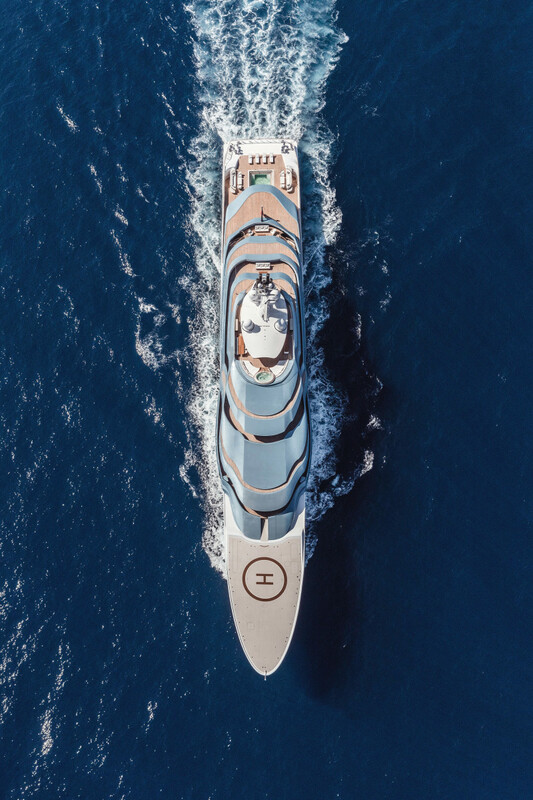 At the time of her launch in 2017, Jubilee achieved two milestones: She was the largest yacht built at Oceanco and the largest yacht built in the Netherlands. 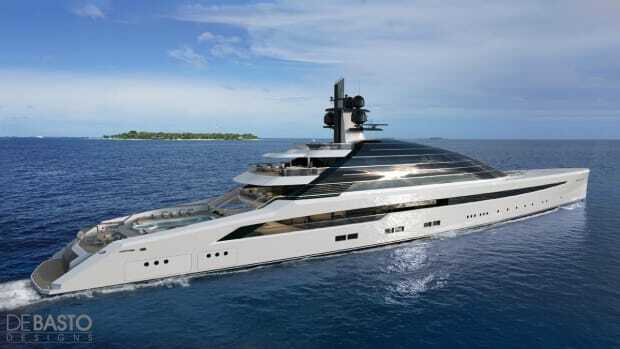 The owner was a member of a Middle Eastern royal family who tapped Australia-based Sorgiovanni Designs to work with the shipyard on the interior. 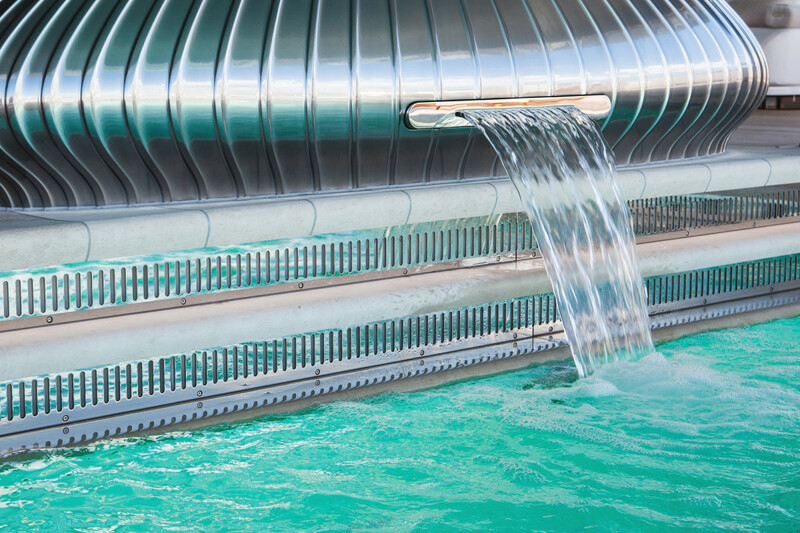 A waterfall feature separates the on-deck dining area from the 26-foot-long swimming pool. 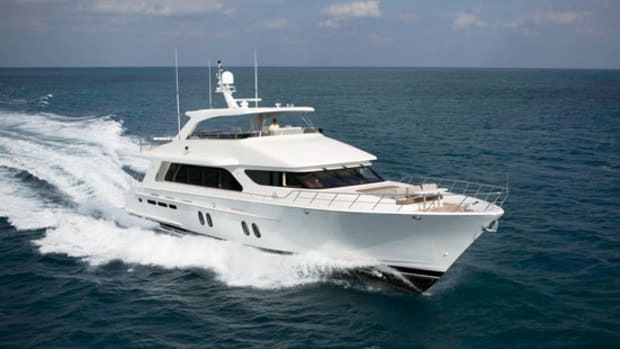 One of the principal requirements was that Jubilee be Passenger Yacht Code compliant, able to accommodate the owners, 31 guests, six staff and 39 crewmembers. 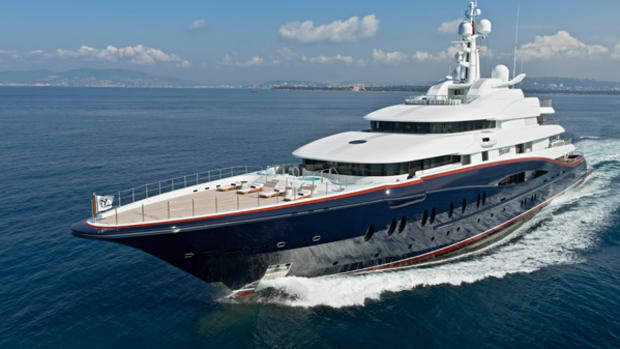 The yacht also needed wheelchair accessibility, which meant wider companionways, lower sills, fixed and removable ramps, a sizable elevator accessing all five decks, and a lifting platform in the spa. The two uppermost decks comprise the owners’ suite, with private access to the sundeck. The bridge is on the upper deck, just below the owners’ decks. Also on the upper deck are four VIP staterooms with a communal lounge and dining area aft. 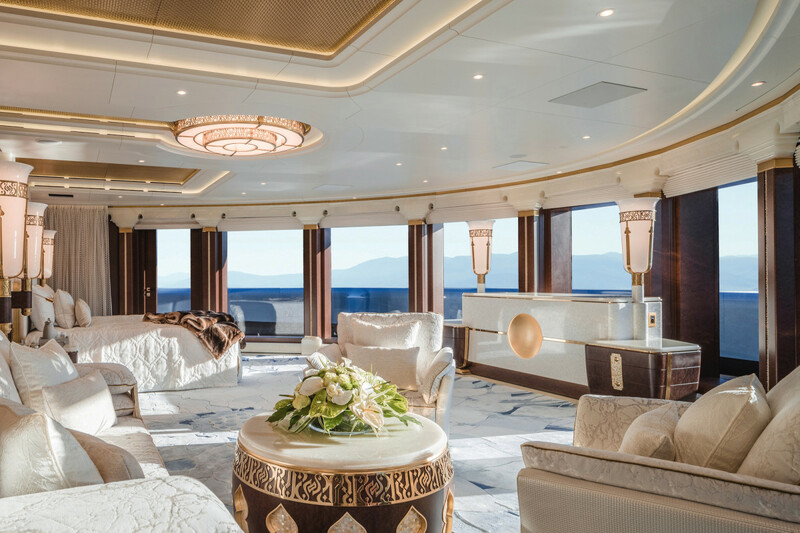 On the main deck are 10 additional guest staterooms, as well as several salons and a club lounge. Foldout balconies to port and starboard in the main salon are near a bar. 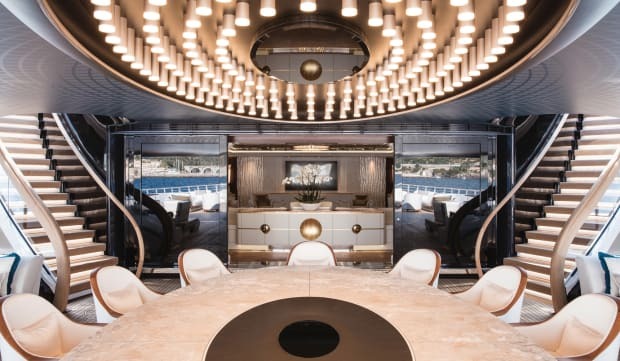 “The spaces on the yacht have to be comfortable both for small groups of people as well as for larger ones,” says Sam Sorgiovanni of Sorgiovanni Designs. The sunny sky lounge benefits from natural light from large wraparound windows. The large central glass elevator is wheelchair friendly. 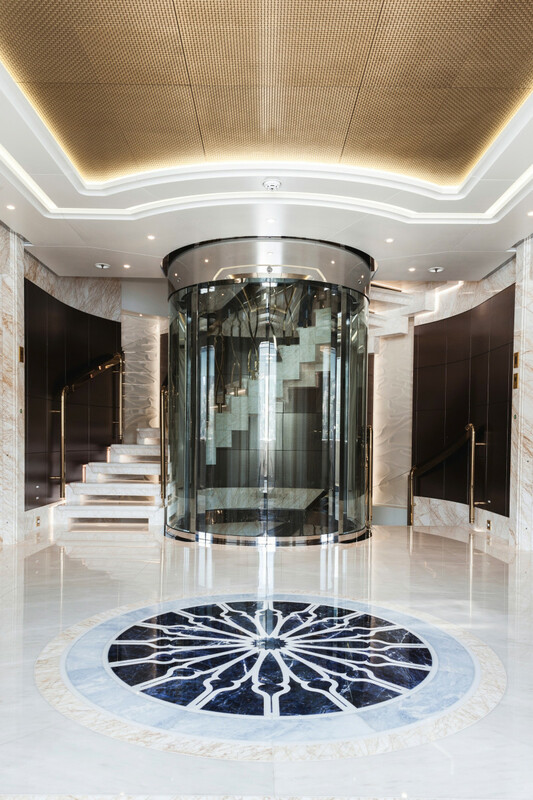 The interior is finished in an abundance of marble, including a four-story floating staircase. (To handle the weight, Jubilee’s hull structure was augmented with high-strength steel.) Sorgiovanni says his inspirations for the interior design were art deco and the casbah atmosphere of Casablanca. Decorative overheads are important in Middle Eastern culture, and on board Jubilee, as well; this is particularly noticeable in the highly ornate salon ceiling. Another interesting ceiling application is found on the main deck aft. The overhead is one flush aluminum surface covered with a custom contemporary pattern with LED down lights. 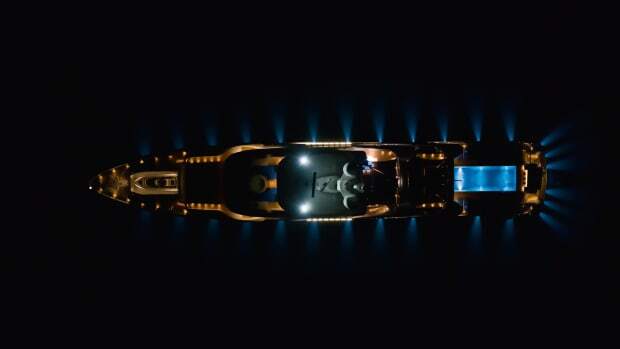 Lobanov says Oceanco was the first to construct such an overhead without seams or panels. On Jubilee’s lower level are a beach club with an aquarium, wellness area, gym and hammam. On the main deck, sun lounges surround a pool. Windows in the pool add light, and a waterfall creates boundaries between the pool and dining area. Decorative columns, inspired by classic architecture, are also structural. The beach club has a built-in aquarium. The central dining area in the salon has a custom chandelier that hides the air-conditioning exhaust. The table’s oval shape echoes that of the chandelier and the whirlpool-like pattern on the teak sole. Lighting throughout the exterior and interior was a major challenge. Lobanov says overheads were illuminated from the cornices, while soles were lighted from the pinths. On the technical side, design was also a factor. 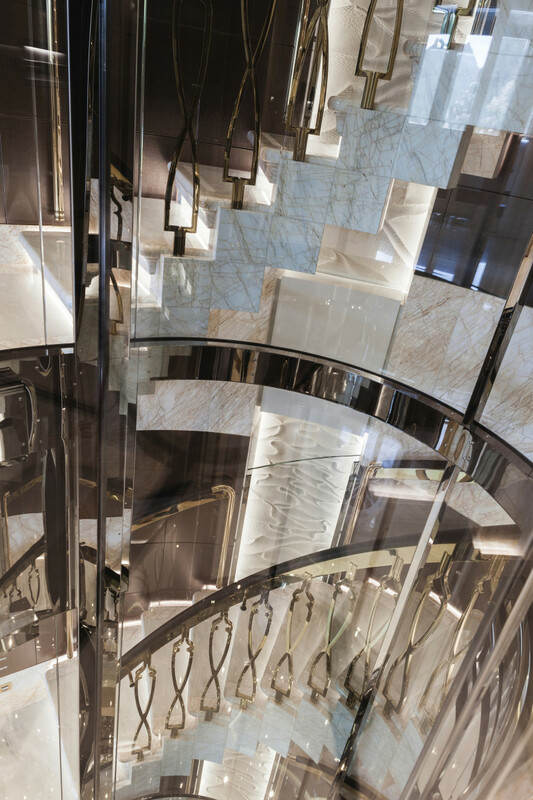 Oceanco built 2-by-24-foot, 3.65-ton cranes so that they nested into the shape of Jubilee’s exterior’s lines. Folding bulwarks for launching the liferafts and rescue boats from the upper deck have integrated LED strip lighting and glass paneling. 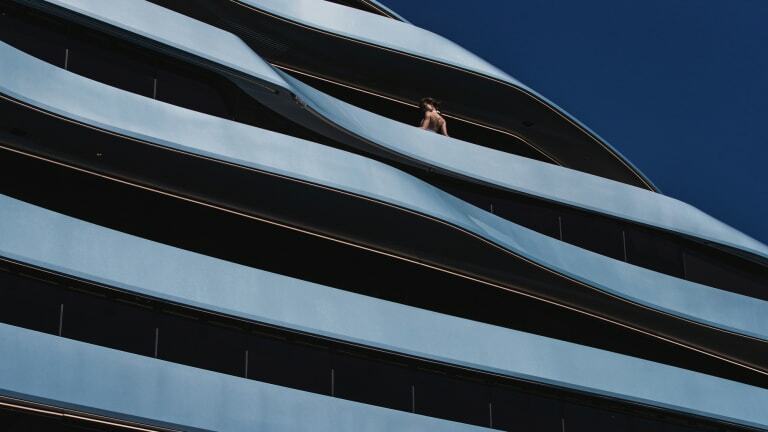 Aluminum and steel work achieved the curvature of the build elements, followed by application of metallic blue paint on the exterior’s complex shapes. Stunning stairs and an elevator connect all five decks. The master suite occupies the top two decks and has its own private access to the sundeck. Another custom fabrication had to do with the yacht’s helicopter. 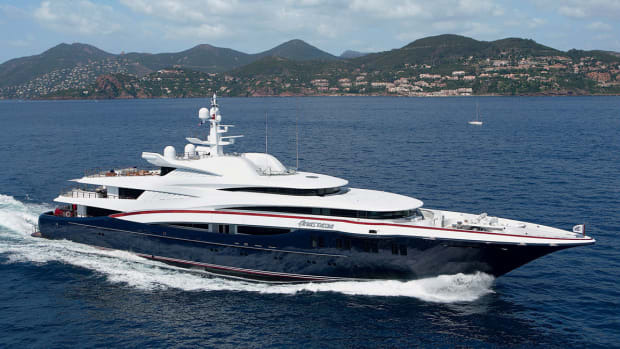 The owner wanted more than touch-and-go operations, so Jubilee’s foredeck was constructed to stow an Agusta 109S GrandNew. The deck has a fixed-foam firefighting system with pop-up nozzles and separate deck drainage in case of fuel spillage. 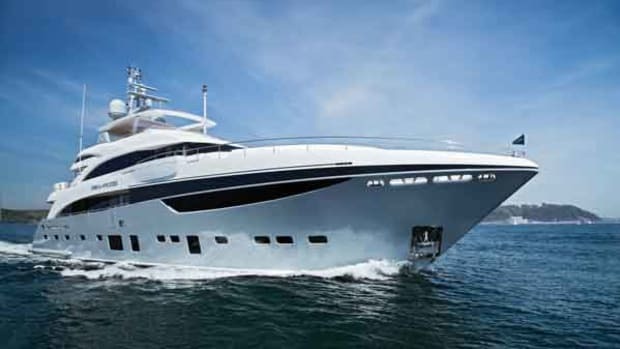 The yacht has fueling and defueling systems, and stowage tanks for jet fuel. A motorized tug moves the helicopter to the stowage position, where it can be tied to the deck. 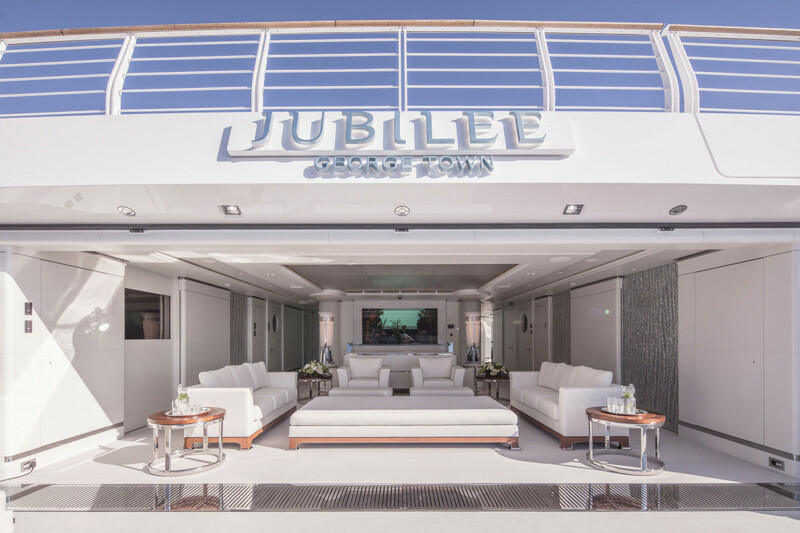 Jubilee has achieved numerous awards, including being Yachts International’s editors’ pick for best exterior styling in 2017. But she is not just a pretty face. The intricacies of her beauty lie deep within. Jubilee’s exterior styling is based on a Lobanov concept called Unfoundland that has above-average deck heights. To visually lengthen the hull, Lobanov created two thin decks in place of one thick one. From overhead, Jubilee looks like a contour map of an island, with each deck appearing at different heights above sea level.